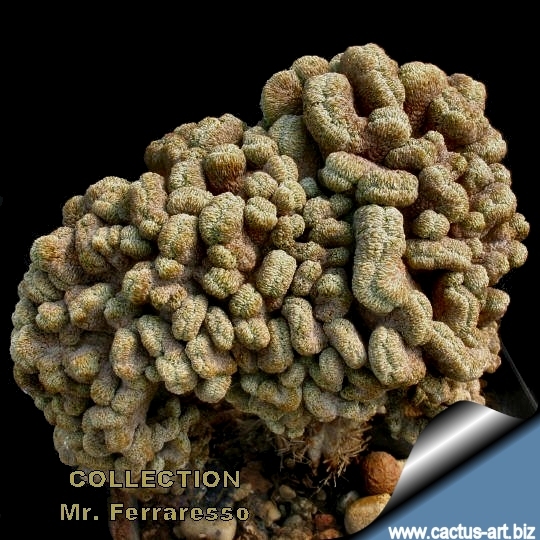 A splendid specimen from Mr. Ferraresso private collection. The cause of cresting: The cause of cresting is not fully explained, biologists disagree as to why some saguaros grow in this unusual form. Some speculate that it is a genetic mutation. Others say it is the result of a lightning strike or freeze damage, but whatever the stimulus, the growth point of the stem has switched from a geometric point, to a line, which folds and undulates as the crest expands. Crested pelecyphore are somewhat rare (1 in 250,000) and can be encountered in many other cactus species. In the ontogenesis a crest can appear any time, but development of crests at large columnar cactus species ( such as in saguaro Carnegia gigantea) in the early stages of ontogenesis is unlikely. On the other hand small species may crest early already at the cotyledons stage.